In the summer, salads (and melons) are pretty much the only things I’m craving. 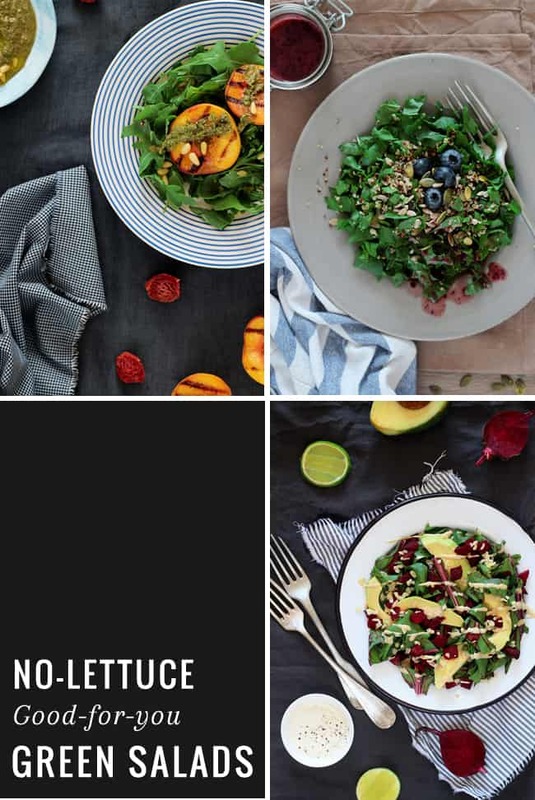 Salads packed with fresh, summery ingredients are a great way to get your daily nutrients and cool off with a light meal on a hot summer evening. There aren’t any special rules for making the perfect salad, but one thing is for sure: variety is key. it’s important to mix different greens and veggies with nuts, seeds, proteins and small amounts of fruits for a mix of textures and flavors. Follow that one rule and you’ll have a healthy meal that nourishes your body with vitamins, minerals, fibers and antioxidants. I always try to branch out and make new combinations of salad ingredients, and with so many veggies and aromatic herbs available at farmers markets in the summer, this is actually a very easy thing to do. 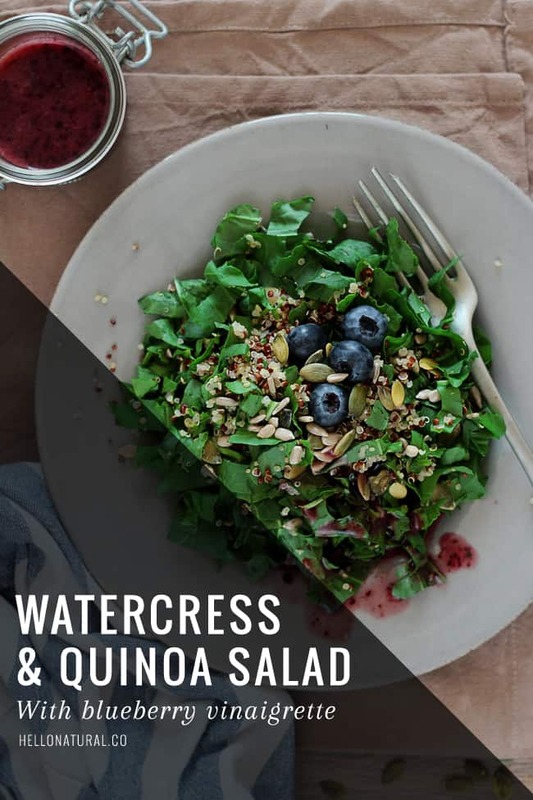 In this quinoa salad recipe, peppery watercress brings Vitamin A and calcium, while the quinoa adds protein and fiber to help you feel full longer. 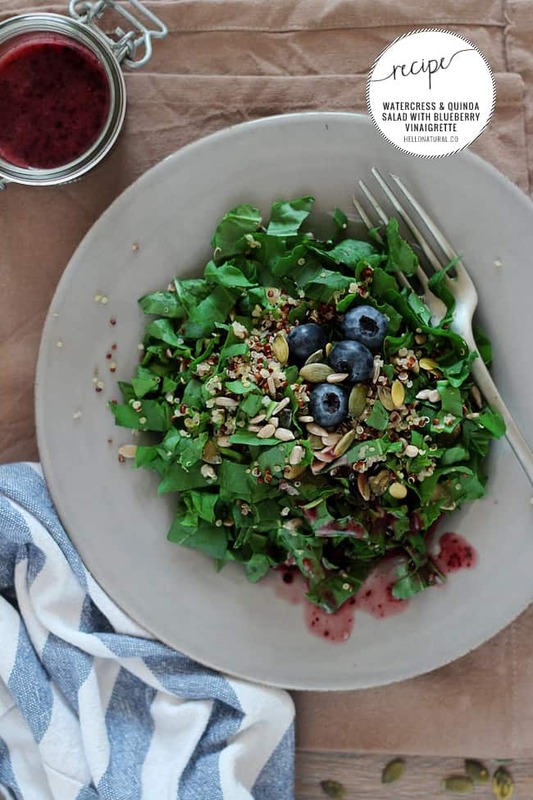 Crunchy seeds and a refreshing blueberry vinaigrette top it all off for a satisfying, summery vegan meal. Easy, delicious salad, packed with vitamin C, antioxidants and protein. Place all the ingredients in the blender, and process until smooth. Mix all the salad ingredients, add the dressing, toss to combine and serve immediately. This looks so tasty and perfect for summer! Yum! That looks soooooo delicious! I’ve already printed it and will make it this week for sure. Thanks.